During our first year of marriage while Mahir was still in business school, and I quit my consulting job to move to Philadelphia to be with him, we spent hours making time consuming Indian curries. The recipes we used- a mix from Web sites and cookbooks- weren’t only elaborate in their preparation but also in their calorie and fat content. The dishes called for 1/4 cup to 1/2 cup oil and copious amounts of either coconut milk or fresh coconut. I remember buying the whole fruit from the local Whole Foods, spreading newspapers on our kitchen floor, cracking the shell open and going through the laborious process of scraping the meat from the inside. Heat the oil on medium heat in a large non-stick pan. Add onions, mix with oil and set heat to medium-low. This lets the onions cook without burning. After 5 to 6 minutes or when onions are soft, set heat to medium and let onions slightly brown. Add in ginger and garlic and fry for one minute, stirring frequently. Add coriander powder and fry for 30 seconds, stirring frequently. Add the remaining spices and mix well. 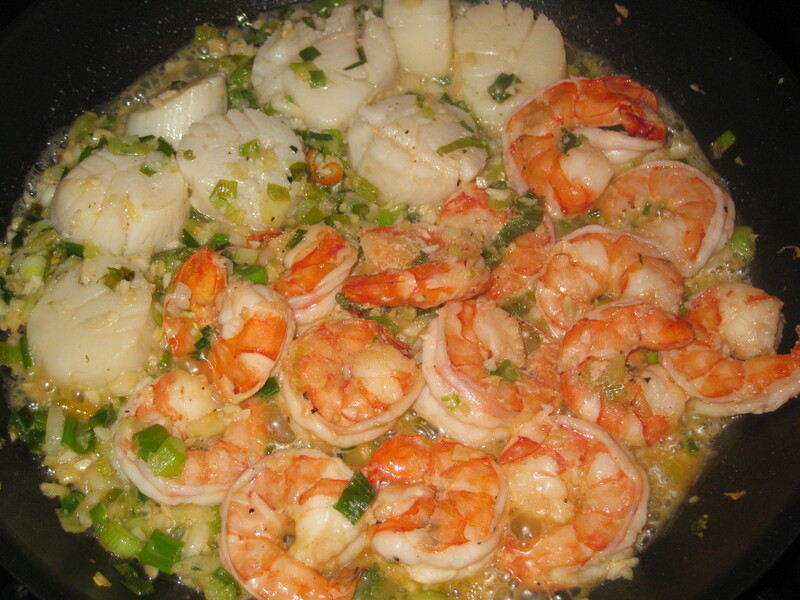 Add in scallops and cook until done. If too much of the water has evaporated, and you want a more soup like curry, add 1/4 cup at a time until you get your desired consistency. Brown or white rice absorbs up the flavorful curry juice beautifully. Onion slivers squeezed with lime juice adds a nice crunch. Spicy cauliflower, steamed spinach or a salad with your favorite lettuce, tomatoes, onions and cucumbers and a lemon and olive oil dressing are great vegetable sides. 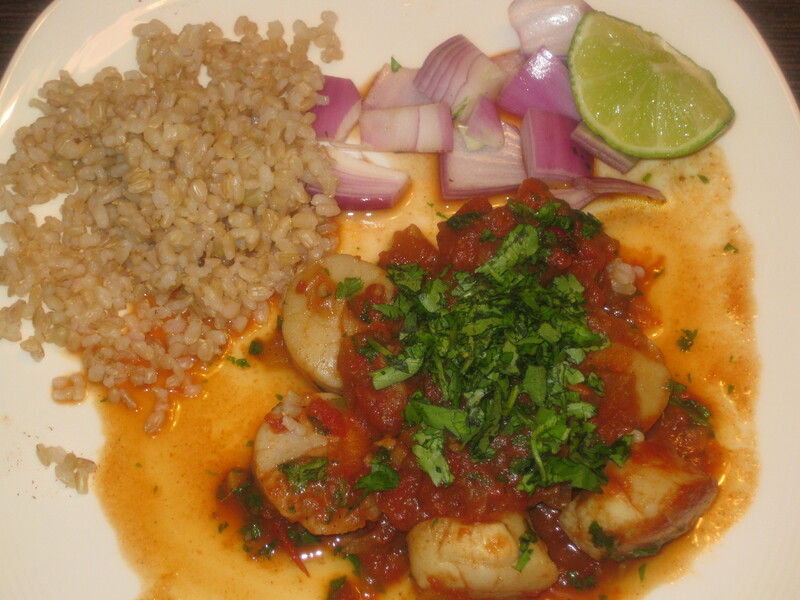 Scallops are only type of seafood you can use in this curry. Any mild fish including shrimp, tilapia fillets and halibut make for an equally tasty end result!